Find the perfect holiday gift for the Coney aficionado on your list with ATZ’s 12 Days of Coney Island Christmas Gift Guide. Like the People’s Playground itself, some of the selections are seasonal pleasures, while others can be enjoyed year round. All can be purchased online. The 111-year-old Coney Island Polar Bear Club has hats, T-shirts, hoodies and blankets ($15-$40) sporting their bear-y adorable logo for sale online. The blanket will come in handy if you plan to join the annual January 1st Polar Bear Dip. Did you know this hugely popular event is also a fundraiser for Camp Sunshine, where children with life-threatening illnesses and their families can enjoy a summer vacation? You and your friends can register online now and pledge a donation to this year’s plunge or help participants like “Cold Is The New Hot!! !” and Lutheran Medical Center’s “Team Spartacus” meet their fundraising goals here. Seven per cent of the $50,000 goal has been raised as of December 9th. Any plunger raising $100 or more will receive a long sleeve Freezin’ for a Reason shirt. Participants over 21 also will receive a limited edition “The Plunge” pint glass, compliments of Coney Island Brewing Company, and an invitation to an after party with the Coney Island Polar Bear Club at Peggy O’Neill’s on Surf Avenue. 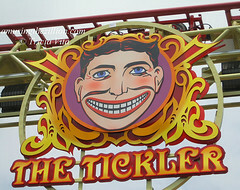 Rita’s of Coney Island is closed till spring but sells gift cards ($5-$100) online year-round. When store owner Ezra Shalam opened the Rita’s franchise this year on Surf Avenue, he brought genuine frozen custard back home to the place of its origin. 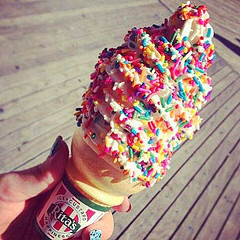 The dessert made its debut in 1919 when the Kohr brothers opened a stand on the Coney Island Boardwalk. The nickel treat was a sensation, selling 18,460 cones on the first weekend! Rita’s menu also offers Italian ice, layered gelati, sundaes with a choice of 20 toppings, sugar-free treats, and items that blend Italian ice with frozen custard. Lola Star’s souvenir boutique, which started out on the Coney Island Boardwalk in 2000, has a satellite location on Bedford Avenue in Williamsburg as well as an online store stocked with her unique designs. 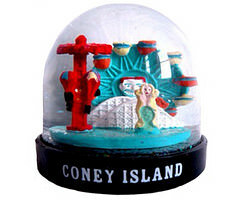 This Coney Island Snow Globe features a mermaid amid miniature versions of the amusement area’s landmark rides ($8). For the same price you can also get a Coney lovebird-themed mousepad. 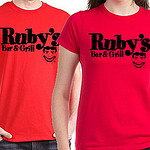 Other stocking stuffers include shot glasses ($6) and an array of Lola Star T-shirts for kids of all ages and adults. Disappointed the games are closed and you can’t spend money to win a plush toy? Order a Hello Kitty Coney Cupcake or Polka Dotted Octopus ($7-$10). Since Brooklyn Cyclones’ tickets for the 2015 season won’t go on sale till next year, you could write an I.O.U. and drop it in the Christmas stocking. 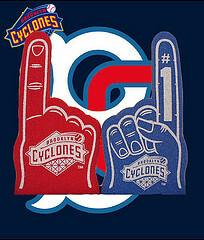 Or buy the fans something they can get their hands on now: A Foam Hand in Christmas-y red or blue with a #1 emblazoned on the index finger and the Cyclones’ roller coaster logo on each side ($7.99). 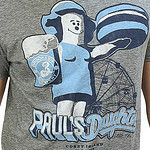 A plush snow bear ornament sporting a Cyclones scarf and a red hat ($11.99) and Cyclones apparel are also available at their online store along with merch for the Brooklyn Bolts, the team that brought pro football back to Brooklyn for the first time since the NFL’s Brooklyn Dodgers in 1946. 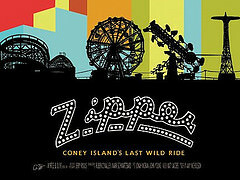 “A small-time ride operator and his beloved carnival contraption become casualties in the battle over the future of Coney Island” is the capsule description of Amy Nicholson’s documentary Zipper, which is available on DVD for just $10 via the film’s online store.. Read ATZ’s review of the film here and see the trailer here. The Deluxe Edition DVD ($20) has Spanish subtitles plus a few extras: A 15-minute movie of the film crew’s trip to Honduras to find the Zipper, where it was sold after being evicted from Coney Island, and a short funny “adult” story by Zipper crew members Joey and Don. Through January 1st, the store is offering a free Zipper tote with a two item purchase. An original Steeplechase horse from one of Coney’s first thrill rides is among the rare artifacts on view at the Coney Island History Project. The history organization offers 1-1/2 hour walking tours ($20 per person) year-round that include a private visit to their exhibit center during the off-season. Advance tickets for 2015 may be purchased online. Walking tours are based on History Project director Charles Denson’s classic book Coney Island: Lost and Found ($29.95), which along with other publications is available on the History Project’s website. Brokelyn.com’s The South Brooklyn and The Rockaways Beer Book ($28) has vouchers for 28 beers at 28 bars including Coney Island’s Freak Bar, Peggy O’Neill’s and Ruby’s Bar & Grill. So that’s $1.00 a beer! The other 25 vouchers are an enticement to bar hop to Bay Ridge, Gerritsen Beach, Gravesend, Marine Park, Sheepshead Bay, Sunset Park, and Rockaway. Coney Island’s amusement parks open for the 2015 season on Palm Sunday, March 29th. Though Luna Park is currently closed for a winter’s nap, the park is offering a December discount on pre-ordered wristbands. Customers who buy one wristband for $32 get a second one free. The deal offers unlimited access to 22 rides at Luna Park for a 4 hour period. Extreme thrill rides, such as the Cyclone and Thunderbolt, and the B&B Carousell are not included on the wristband. Check website for details. While recovering from Sandy and building the new “Ocean Wonders: Sharks!” exhibit, scheduled to open in spring 2016, the New York Aquarium remains open 365 days a year. 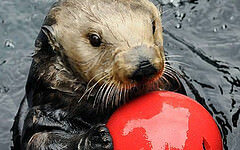 Gift memberships help the Wildlife Conservation Society save wildlife and wild places worldwide and start at $75. Benefits include free admission to the Aquarium as well as the Bronx Zoo and three other zoos in the City. One of the perks of premium membership ($119-$189) is free parking in the Aquarium’s lot, which is a very desirable perk for frequent visitors to Coney Island. It’s time to deck the halls with boughs of holly, but is anyone else dreaming of summer? It’s not too early to buy a judgeship for the annual Mermaid Parade, which is Saturday, June 20, 2015. 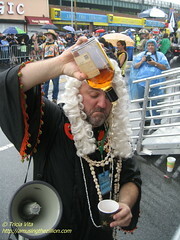 Parade organizer and arts org Coney Island USA’s $150 Big Spender membership entitles the giftee to be an official Judge of the Mermaid Parade with VIP seating on the reviewing stand and a Mermaid Parade Judge T-shirt. Oh, and partake in the bribes offered to the judges by the paraders: beer, vodka, more beer, chocolate cake, beer, lubricants, play money, glow in the dark octopus toy, more beer, more vodka, lemonade, rum balls, and finally more beer. It’s no wonder the judgeships are “sold out” well before the parade. Memberships support arts programming at CIUSA and start at $35 with benefits including free admission to the freak show.